Over the last year or two, I have enjoyed doing my family tree on Ancestry.com. I really didn’t know anything about half of my family history before starting that tree. My parent passed away when I was five years old and one side of the family was a complete mystery. It is good to see there is a blood line from my father’s family that is thriving. As I look at the tree, I see many characters that would be great fodder for a story or even a book! My grand Uncle Otto lived in Collinsville IL. Many of the family came from that area. According to the Alton Telegraph, a local newspaper, he ran a small bar. Apparently, it was the local gambling house. In 1943 he was arrested and I guess it was closed down. My writer’s imagination can see the place in gritty black and white details like an old movie. Good old uncle Otto. Aunt Minni, the sister of my grandfather, William A. Daech II, married a man named John Preston Brown. This guy was in the race car business. He either drove or rented race cars for others to have fun. His business was Brown’s Drive-yourself. 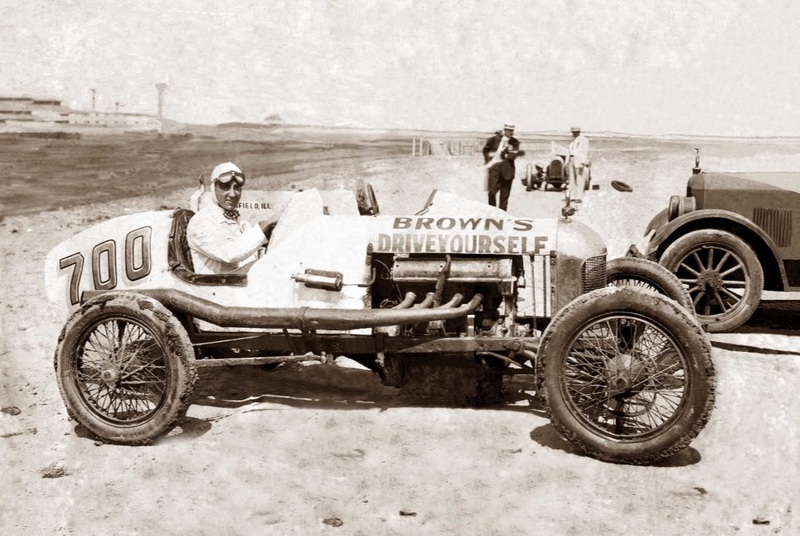 The old photos of him and his car conjure up roaring adventures around the mud tracks of yesteryear. That’s good material for a chapter or two. 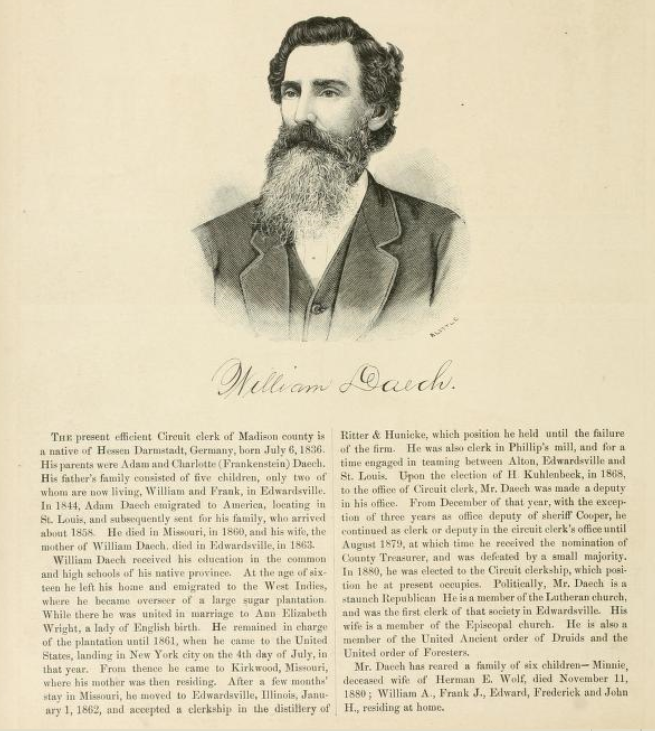 My middle namesake, William F Daech, was an overseer of a sugarcane plantation in the Caribbean. I imagine he was overseeing slaves, working the cane, chopping and burning fields for harvest. The cane was used to make island rums. He married an English woman and had a child in the islands, but the roots of the family ended up in the States and settled in Edwardsville where he ran a distillery. I can almost imagine their hot romance on the tropic plantation as a book by itself. Great Great Grandpa William also served as the treasurer and sheriff. He was very active in the miners union and was major part of the union bargaining conventions. He was quoted in the Marxist magazine, The Worker on his labor beliefs. He was very political. The historic documents mention that he was a druid. Investigating my ancestry opened my eyes to living uncles and aunts that I didn’t know I had. It gave me insights into past roots that I never knew about, and it sparked my imagination of the adventures they may have lived. Who knows, a new book may be developing from the characters in my families past. Will it be fiction or non-fiction, maybe a little of both? Only the future will tell!